Model of Homo erectus at Westphalian Museum of Archaeology (Westfälisches Museum für Archäologie). Herne, Germany. Homo erectus is the species name assigned to human fossils that evolutionists claim are transitional forms between australopithecines (apes) and both Neanderthals and modern humans. To date, more than 280 fossil individuals have been found that are identified with this group. The species name means “erect or upright man” and was the name first put forth by Ernst Mayr to unify the classification of Asian fossils. Creationists generally agree that all supposed ape-men fossils are, in fact, either ape or fully human. Species names within the taxonomic genus homo are viewed as fabricated classes invented to support evolutionary theory, and should be regarded as mere instruments of propaganda. The majority of Homo erectus fossils represent the populations of humans that lived following the global flood and the Tower of Babel, and should be considered true Homo sapiens. Although a formal definition of Homo erectus has not been established, the following characteristics are generally accepted. There are several problems with the assignment of Homo erectus as an evolutionary transitional form to Homo sapiens and Neanderthals. These include the absence of morphological distinction when compared to the full range of characteristics in modern humans, and overlapping timeframes of H. erectus with anatomically modern humans. Homo erectus was previously thought to produce babies with relatively small brain capacity. However the discovery of the pictured pelvis has shown that they were actually capable of birthing babies with a cranial circumference very close to the lower end of the range of our own species. When the cranial capacity of Homo erectus is compared with Homo sapiens the morphological distinctions blur even further. Homo erectus has a cranial capacity from 780 cc to about 1225 cc, whereas modern humans have a capacity from 700 cc all the way up to 2200 cc. Clearly H. erectus falls with the natural range of modern humans in not only vault thickness, but cranial capacity as well. The close comparison was extended to newborns by a discovery in 2008 of a Homo erectus pelvis, which showed that their infants could have had a head much larger than previously thought. According to Sileshi Semaw, a paleoanthropologist at the Stone Age Institute and Indiana University-Bloomington, H. erectus infants could have had a head size of 318 mm in circumference, which is right at the lower end of the spectrum of modern day humans whose cranial circumferences at birth typically range from 320-370 millimeters. Neanderthals have also been shown to fall within the range of modern humans, having a skull capacity ranging from 1200 cc to 1650 cc. In fact, the skull morphology of the Homo erectus is virtually identical to Neanderthal - differing only by size. Composite Human Fossil Chart. Illustrates the comparable dates assigned to Homo erectus, anatomically modern Homo sapiens, Neanderthals, and Early African/Asian Homo sapiens. Also shown are Australopithecus and Homo habilis. Skulls with Homo erectus-like features are found around the globe in location such as Europe, Asia, Australia, Indonesia, and Africa. Furthermore, researchers have shown that Homo erectus and Homo sapiens traits occur concurrently in the stratigraphic layer at many locations. Thick-vaulted and gracile (thin-vaulted) skulls are often found to co-occur in the same strata showing that they lived at the same time and place. The extensive timeframe of Homo erectus fossils overlaps other hominids so extensively that it should void any attempt to claim an evolutionary sequence. For example, Homo erectus is almost universally held to have evolved from Homo habilis despite the fact that their fossils appear at roughly the same time (the oldest H. erectus fossil is dated at 1.95 mya and the oldest H. habilis fossil dated at just over 2.0 mya). Furthermore, they continued to coexists throughout the entire 500,000 year span when Homo habilis is said to have lived. Such inconsistencies between the theory of evolution and the fossil evidence are often concealed. Marvin Lubenow warns in his book, Bones of Contention, about the way that evolutionists present the relationship between Homo habilis and Homo erectus.. Furthermore, H. erectus is shown to have lived alongside what are known as “early Homo sapiens” during their entire 700,000 year existence, and alongside Neanderthals throughout the 800,000 years of their history. And lastly, Homo erectus individuals have lived side by side with anatomically modern humans for 2 million years (according to evolutionary chronology). For Homo erectus to provide support as a transitional form between the australopithecines and modern humans, the dates assigned to erectus fossils should occur between these other groups with minimal overlap. The extensive timeframe during which H. erectus is found to exist effectively eliminates the possibility that they evolved into Homo sapiens. These discoveries illustrate significant problems with the evolutionary model. Not only do the dates show that H. erectus lived contemporaneously with anatomically modern humans, but remained virtually unchanged for almost two million years. A number of nonevolutionary explanations have been put forth to account for the variations seen in some of the ancient humans. These include genetic drift in the small populations following the Tower of Babel language division, adaptations to diet and/or climate, and changes in the rate of skeletal maturation. Some may even be mere consequences of harsh living conditions in the immediate post-Flood period, which differed greatly from those of today. Beasley proposed that the longer life spans which persisted following the global flood are likely responsible. This longevity resulted in a prolonged duration of skeletal maturation of the early post-Flood humans, and facilitated the growth of thick cranial-vaults. With the much reduced life spans of humans generations after the flood, thick cranial-vaults became much less common. 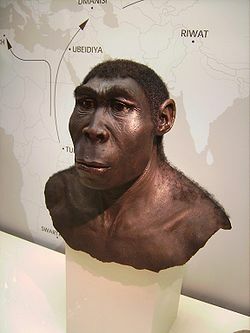 Java Man was the common name for the first fossil evidence to be discovered of what is now called Homo erectus. It was found in 1891 by Eugene Dubois who was a former student of Ernst Haeckel. Dubois named the find Pithecanthropus erectus (erect ape-man). Java Man is arguably the best-known human fossil, and was the evidence that first convinced many people that humans evolved from ape-like ancestors. Since its discovery, there has been much controversy over both the identification and dating of the strata where the fossils were found, and whether the fossils belonged to the same species. Peking Man Skull (replica) presented at Paleozoological Museum of China. Peking Man is the common name for one of the original Homo erectus fossils to be discovered. It was unearthed between 1923–27 near Beijing China from which it gets its name (Beijing was previously written 'Peking'). It was originally announced to be a new hominid species based on the discovery of a single tooth and named Sinanthropus pekinensis. Later discoveries of several skull caps and jaw bones revealed that Peking man was very human-like and it was reclassified as Homo erectus pekinensis. Excavations under the supervision of Chinese archaeologists Yang Zhongjian, Pei Wenzhong, and Jia Lanpo uncovered 200 human fossils (including 6 nearly complete skullcaps) from more than 40 individual specimens. Excavation came to an end in 1937 with the Japanese invasion, but resumed after the war, and parts of another skull were found in 1966. The Peking Man Site at Zhoukoudian was listed by UNESCO as a World Heritage Site in 1987. New excavations were started at the site in June 2009. Some have argued that certain Homo erectus fossils found in East Africa are a distinct species called Homo ergaster, the name being derived from the Ancient Greek ἐργαστήρ "workman". Many that except this species hold that they are the ancestors of modern Homo sapiens, rather than erectus. It is asserted that H. sapiens then migrated from Africa replacing Homo erectus (or archaic Homo sapiens) populations found in other parts of the world. This model of human evolution is known as the Out-of-Africa theory, which is distinct from the competing view known as the Multiregional theory. However, there remains considerable debate as to whether Homo ergaster should be considered a separate species from Homo erectus, and many in fact treat them one and the same. In 2002, a skull was discovered in Ethiopia with distinctive Homo erectus features that was dated at 1 mya (by evolutionary chronology), supporting the earlier view that erectus lived in Africa when Homo sapiens are believed to have first evolved. Carl Wieland from Creation Ministries International notes that this discovery simply highlights the subjectivity of human fossil interpretation and the tight morphological overlap between fossils that are often identified as separate species. ↑ Lubenow, Marvin. Bones of Contention: A Creationist Assessment of Human Fossils. Grand Rapids, MI: Baker Books, 2004. p. 115. ↑ Homo Erectus — A Fabricated Class of 'Ape-Men' by Malcolm Bowden, Journal of Creation, Vol.3, 1988, pp. 152-153. ↑ 4.0 4.1 .Brown, P., cranial-vault thickness in Asian Homo erectus and Homo sapiens, in: Franzen, J.L., ed., 100 Years of Pithecanthropus: The Homo Erectus Problem, Courier Forschungs Institut Senckenberg 171, pp. 33–45, 1994. 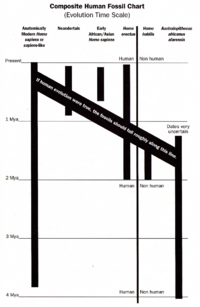 ↑ 5.0 5.1 5.2 How different is the cranial-vault thickness of Homo erectus from modern man? by John Woodmorappe, Journal of Creation 14(1):10–13, April 2000. ↑ 6.0 6.1 Discovery Questions Intelligence of Human Ancestor National Science Foundation, Press Release 08-203, November 18, 2008. ↑ Beasley, G.J., Archaic fossil human remains—an update, Journal of Creation 9(2):169–215, 1995. ↑ Perloff, James. Tornado in a Junkyard: The Relentless Myth of Darwinism. Burlington, MA: Refuge Books, 1999. ↑ Lamb, Andrew. ‘Southwest Colorado Man’ and the year of the one-tooth wonders Creation Ministries International. 2007. ↑ Homo erectus pekinensis Wikipedia. Accessed January 12, 2012. ↑ Homo ergaster Wikipedia, Accessed September 18, 2011. ↑ Out-of-Africa versus the multiregional hypothesis Nature Education, Accessed September 18, 2011. ↑ Homo erectus by Dennis O'Neil. Behavioral Sciences Department, Palomar College, San Marcos, California. ↑ Homo ergaster ArchaeologyInfo.com, Accessed September 11, 2011. ↑ Skull may link pre-humans to modern man Cable News Network, March 22, 2002. 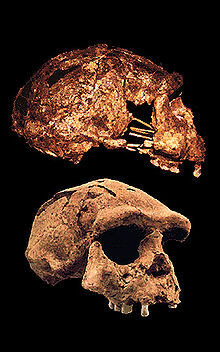 ↑ Skull wars: new ‘Homo erectus’ skull in Ethiopia by Carl Wieland, Creation Ministries International, March 22, 2002. Homo erectus 'to' modern man: evolution or human variability? by A. W. (Bill) Mehlert, Journal of Creation 8(1):105–116, April 1994. This page was last modified on 25 July 2014, at 09:56.